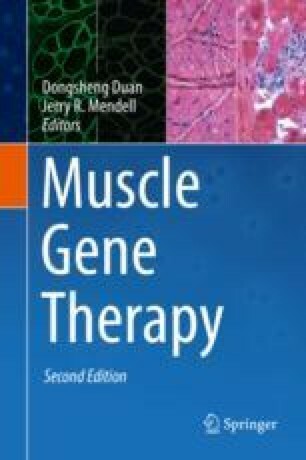 A founder allele in the DMD gene results in a syndrome ranging from minimally symptomatic Becker muscular dystrophy to asymptomatic hyperCKemia via expression of a highly functional N-terminal deleted version of the dystrophin protein (the ΔCH1 isoform). Translation of this protein results from utilization of a recently discovered internal ribosome entry site (IRES) within exon 5. The IRES is not active in the presence of a duplication of exon 2—the most common single-exon duplication—but is active in its absence. We have developed an AAV-encapsidated U7snRNA vector that targets and induces skipping of exon 2, resulting in either expression of a wild-type dystrophin or of the ΔCH1 isoform, either of which is therapeutic.